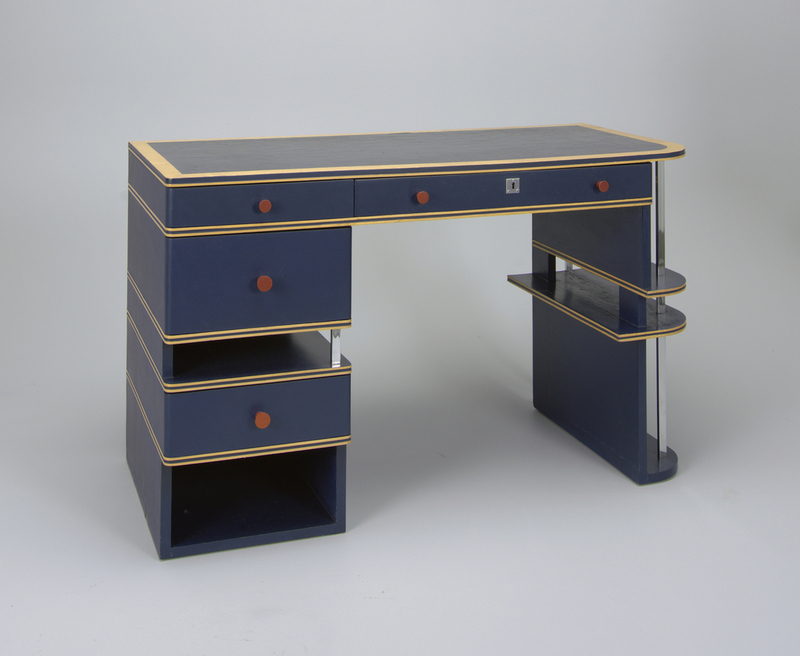 This desk by Paul Frankl is an example of American streamlined furniture of the 1930s. Frankl trained as an architect in Germany and Austria before settling in New York in 1914, as a decorator and designer. He created geometric furniture designs for Frankl Galleries in Manhattan. Frankl’s design philosophy centered on designing for the future, thinking new materials required new forms. His ideas were influenced by the simplicity and cleanliness that he encountered while traveling in Japan prior to the outbreak of World War I. The colorful parallel lines of this desk show Frankl’s emphasis on the horizontal. He wrote that straight lines and sharp angles are modern, but curves could be used to create highlights, such as those reflected in the bright surfaces of the desk’s vertical chrome elements and its curved shelves. This desk also reflects Frankl’s writings on interior design, which stressed the importance of mass production. Mass production allowed for more choices, such as color, which was important for expression in an interior. Modern furniture should be able to adapt to a variety of surroundings—the use of primary colors, as seen in this desk’s overall blue and the touches of yellow and red in the edges and drawer handles, achieved such adaptability. As part of his dedication to making design accessible to the everyday consumer, and to spread the modern aesthetic, his work was exhibited at Macy’s 1927 Art in Trade exhibition where all the items on display were also for sale through the store. This desk is currently on display as part of Cooper Hewitt’s Making Design exhibition. Paul T. Frankl, Form and Re-form: A Practical Handbook of Modern Interior (1930): 3. Christopher Long, Paul T. Frankl and Modern American Design (New Haven: Yale University Press, 2007): 1. Paul T. Frankl, New Dimensions; The Decorative Arts of Today in Words & Pictures (New York: Payson & Clarke, 1920): 38. Frankl, Form and Re-form: 107. Long, Paul T. Frankl: 26. Desk (USA), ca. 1933. lacquered wood, painted canvas, chromed metal. Gift of Joel and Anne Ehrenkranz. 2006-24-1.